Polypipe Polyfit 22mm x 25m barrier pipe, straight coiled length, material: Polybutylene with EVOH barrier, colour: white. Flexibility - flexible pipe means it can more easily be ‘cabled' around obstructions. ‘Cabling' the pipe means fewer joints are required. Fewer joints reduce installation time and system costs. Push-fit means no naked flames with reduced inherent risks. 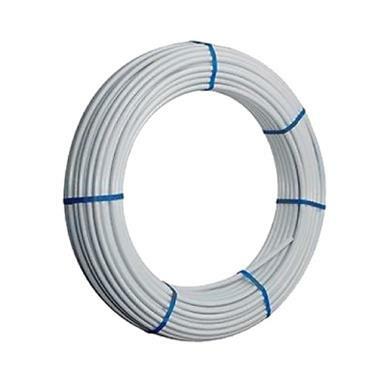 Good resistance to freezing temperatures, maintaining long-term durability in heating and water applications. Plastic pipe means no scale build-up. No corrosion and reduced risk of burst pipes. Quieter in service, cooler to the touch and less heat loss. "Plumb Straight" technology - Polyfit coiled pipe is designed to effectively remain straight when un-coiled. NOTE: Polybutylene pipe must not be used for long permanently exposed runs of pipe where appearance is important. Designed for central heating systems. Incorporates an oxygen barrier to inhibit oxygen permeation. Use of inhibitors is recommended as corrosion can occur in all types of system regardless of pipe material. May also be used for domestic hot and cold water services. For more detailed information, please refer to Polyfit Plumbing and Heating Brochure .